OPINION: Who want Joost invitations? Joost have caught my attention lately, a Video Streaming Software (or call it as Broadband TV) I came to know through Lifehacker. If you are looking for a software that lets you watch lots of entertaining indie English channels, this is for you. I previously reviewed TVU player in this blog and recently I came across yet another copycat called Sopcast that eventually allowed me to watch ICC worldcup through Banglasmash live streams. 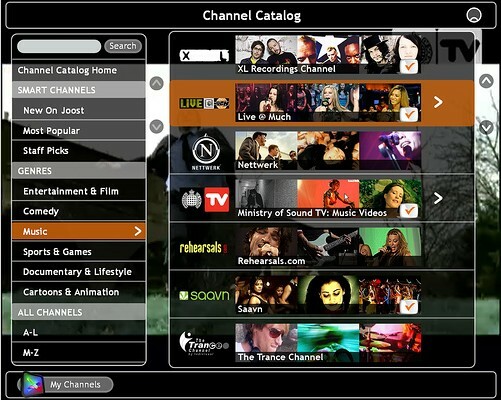 Joost is based on altogether new concept, not merely relaying TV recorded streams through P2P. Over the time TVU and Sopcast has became so slow and flooded with Chinese. And yeah, as in real TV you will see lots of commercials with the programs, but not in Joost. I came to know about a lot of good indie productions through Joost. Joost is more like a TiVo in a sense that you will be able to choose the exact program not merely Channels, and you can rewind or forward when you watch. Could you please send me a Joost invitation?